Last time I gave you a project update, I mentioned that we were working on a local LAN event for Extra-Life 2016. Much has happened with this project, but the latest development requires a bit of an explanation. We decided to seek out other pastures when it came to collaboration with a group to sort out the computer part of the event. We have decided to go with Sorby esport, who is hosting the largest Fifa event here in Denmark in May. The event will take place in Sorbyhallen, Kirkerupvej 16 4200 Slagelse. 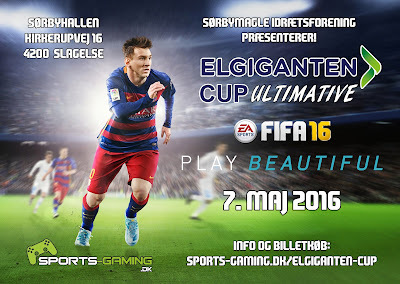 It is presented by Sorby esport, which is part of Sorbymagle Idraetsforening. It is sponsored by Elgiganten and EA sports. Sports-gaming.dk handles a lot of the technical aspects of the event and you can get more info and buy tickets online.